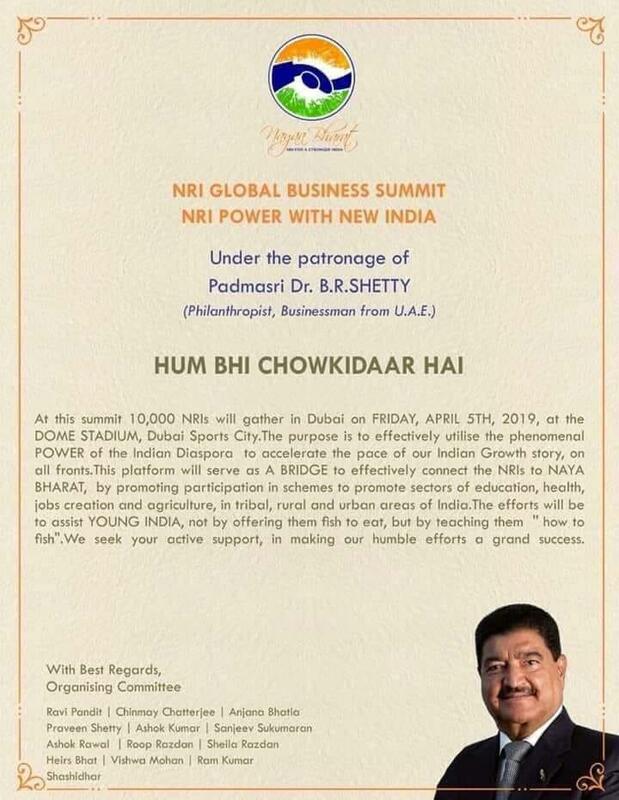 Dubai: NRI Global Business Summit that will be organised on April 5, evening under the leadership of renowned businessman and NRI, Padma Shri BR Shetty, is being alleged to be a politically motivated move. 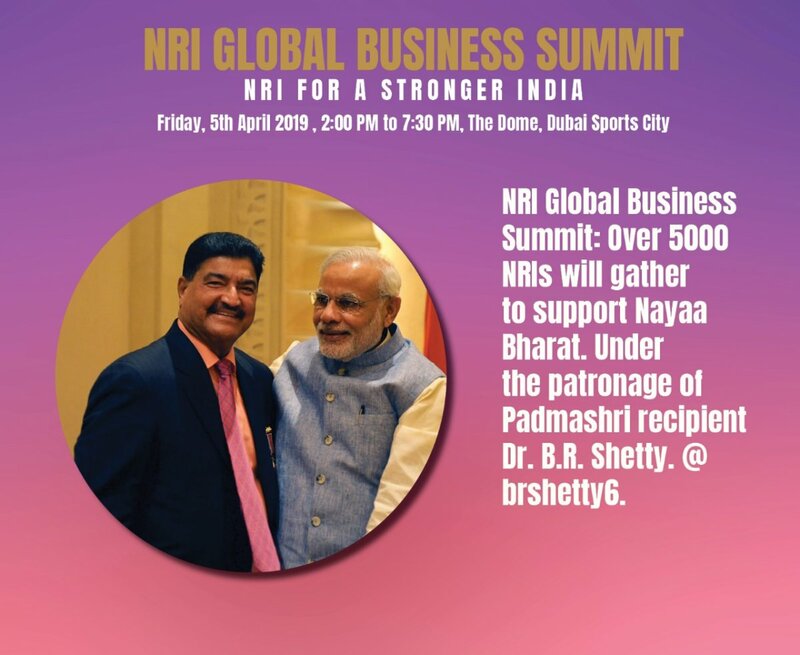 The summit which will be led by BR Shetty is expected to be participated by around 5000 NRIs. The posters and cards of the summit had slogans of ‘Hum bhi Chowkidar’ (We too are watchmen) a slogan coined by PM Narendra Modi ahead of the party’s campaigning for the Lok Sabha Election. The printed slogans on posters and cards have led to discussion that the summit is politically motivated and aims at promoting Narendra Modi under the banner of ‘Global Business Summit’. 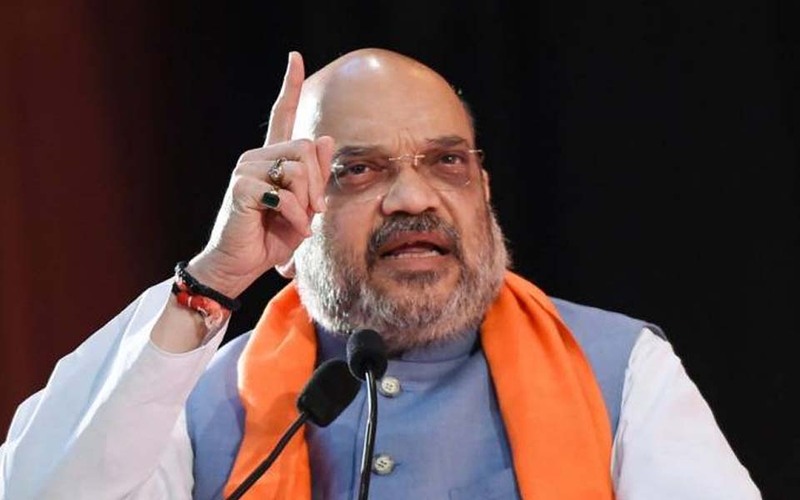 In a press conference ahead of the summit, answering to a query by a reporter if it was a politically motivated event, BR Shetty replied with a no and said “It is not connected with any political party, it is an apolitical event”. 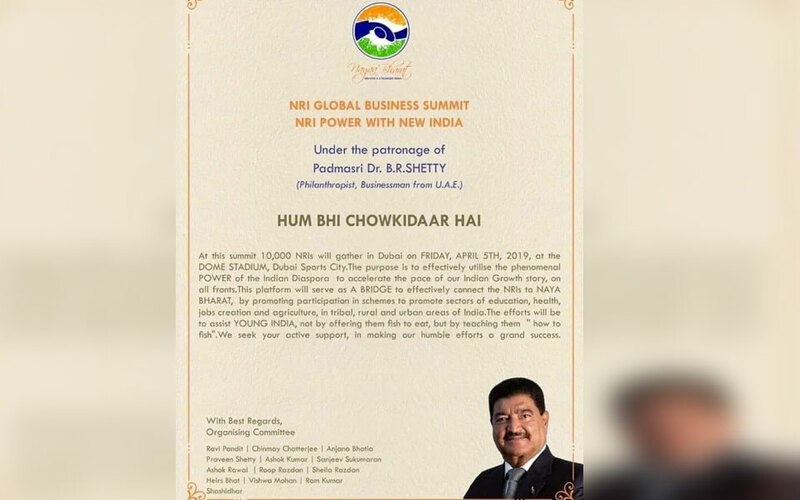 When the reporter again asked about why was the slogan ‘Hum bhi Chowkidar’ was printed on the cards and posters of the summit, Shetty said “That slogan is nice and sounds funny. That is why we have added it in the banners and posters”. Interestingly, a close aide of PM Narendra Modi, Swami Paramatmanand was also present at the press conference. Media in Kerala have quoted Swami Paramanand terming every Indian staying in abroad and thinking about the country as ‘Chowkidars’. Chakravarthy Sulibele, a Sangh Parivar speaker and a campaigner of Narendra Modi will also be attending the summit in Dubai. BR Shetty has also been recently widely recognized as the supporter of BJP and Sangh Parivar. 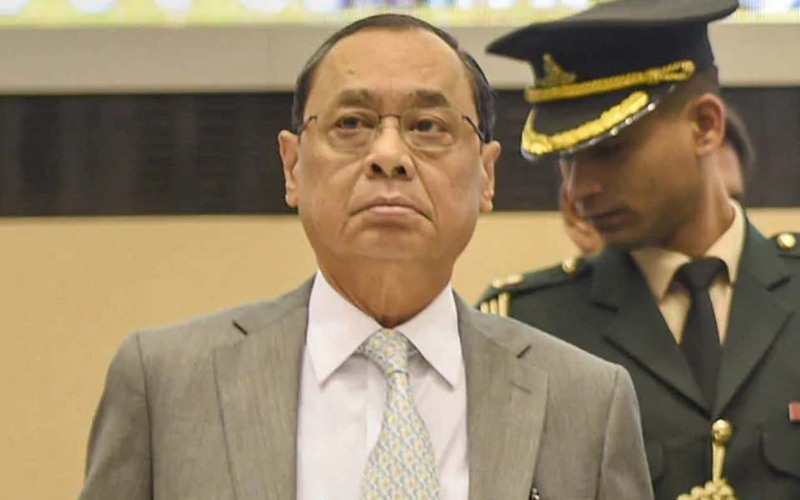 In an advertisement the businessman was seen calling for Modi government to be brought back to power.